Description: CN Train M396 backs past the depot to make a drop-of and pick up in the yard. 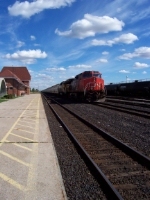 Description: Having completed its work in the Durand Yard, Train 396 Resumes its journey to Toronto as it prepares to cross the diamonds in Durand. Description: CN power is pretty common on trains between Everett and Vancouver BC. Description: Inbound PRGEVE making its way down the mainline at Delta Yard. Description: A very nice lead unit on todays A406. Much nicer then a CN unit! Description: Two units again today on the transfer.